Completed in 1603, the bridge was the symbol of the start point of the official five highways, including the Tokaido highway, which ran from Edo, or present day Tokyo, to Kyoto. 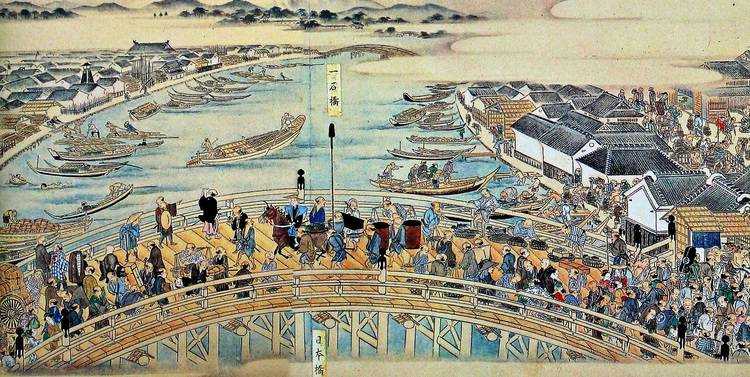 The bridge is also well known for being illustrated in “The Fifty-Three Stations of the Tokaido”, a series of ukiyo-e woodblock prints created by Utagawa Hiroshige. The first wooden bridge was completed in 1603, when it was the starting point of Nakasendo and Tokaido, highways connecting Edo to Osaka using two different routes. During this time, it was known as the Edo Bridge. The bridge accelerated the huge amount of traffic linking the two cities, becoming a crucial fixture to the prosperity of the city of Edo, or present day Tokyo. 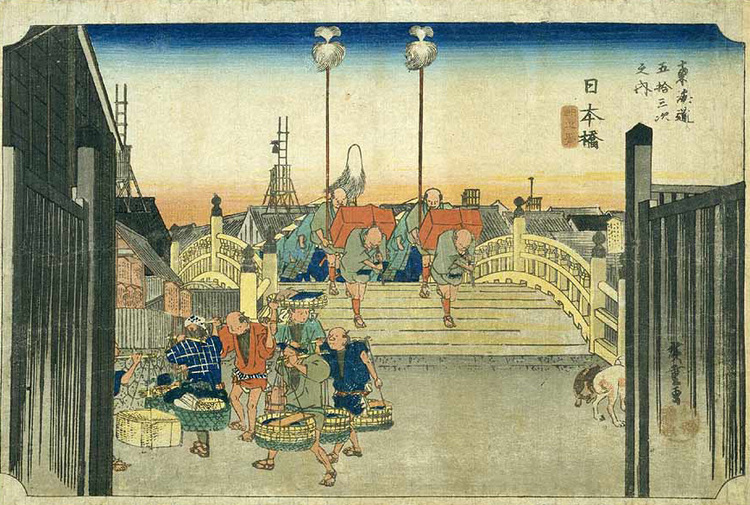 Nihonbashi Bridge is well known for being included in “The Fifty-Three Stations of the Tokaido”, a series of Ukiyo-e woodblock print created by Utagawa Hiroshige. It was completed after his first trip along the Tokaido highway in 1832. 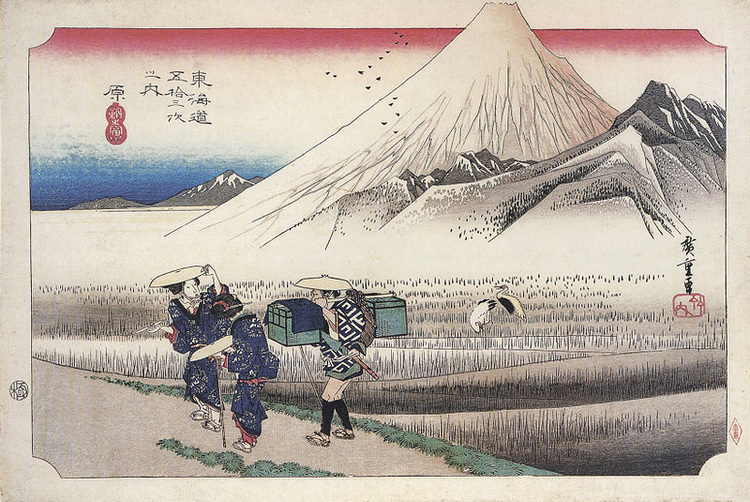 Hiroshige’s works have been very influential to other artists, with collectors of Hiroshige’s works including Vincent van Gogh and Frank Lloyd Wright. 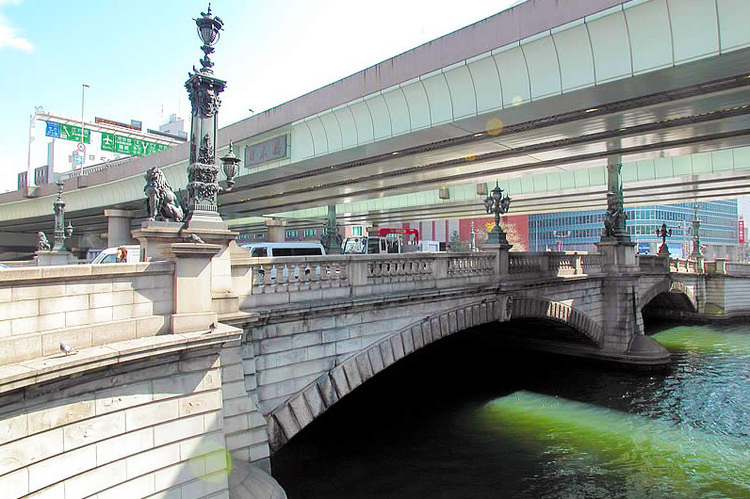 In the Meiji era, the wooden bridge was replaced by a larger stone bridge, which still stands today. Shortly before the 1964 Tokyo Olympics, an expressway was built over the Nihonbashi Bridge, obscuring the historical view of Mount Fuji from top of the bridge. Local citizens have been petitioning the government to reconstruct this expressway underground, so as to bring back a sense of old Edo. Starbucks Coffee Nihonbashi Suruga Bldg.